Propeller vehicle that moves above water (or land) by gliding on a cushion of air it creates by blowing downward. Device that is made up of blades integrated with a shaft; it pushes air behind the hovercraft thus causing a forward movement. Lamp that is visible from afar to signal the hovercraft’s presence. Intake opening for the fan. Detection device that emits radio waves and receives their echo; it is used to avoid collisions and to navigate when visibility is reduced. Door for passengers to enter and exit the cabin. Compartment from which the pilots operate the hovercraft. Flexible and pliable extension to the skirt that adapts to the surface of the water. Rubber flexible side that surrounds the edge of the hull to trap the air blown down by the lift fan; this increases pressure, which in turn causes lift. 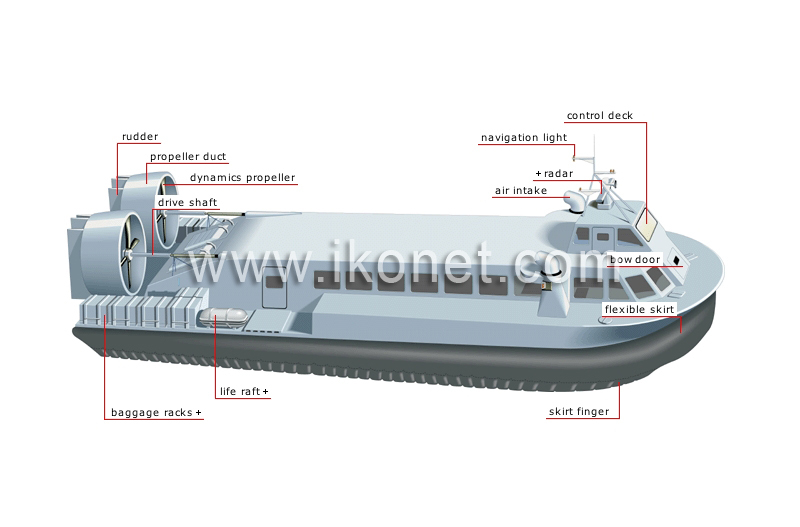 Inflatable boat that transports passengers and crew in case of emergency. Part transmitting the engine’s rotational movement to the propellers. Pivoting part behind the propeller blast for steering the hovercraft. Metal part that surrounds the propeller and increases its power by concentrating its air intake.